Dream home, meet dream home loan. Buying a home or refinancing is easy and affordable with a mortgage from Ascend. We offer great interest rates, flexible terms and flexible down payments. As a credit union, we share our profits with our members in the form of low interest rates on home loans. On most portfolio loans, we offer down payments as low as 5%. For first-time homebuyers, down payments can be as low as 0%. In some cases, down payments can be borrowed or gifted. Your mortgage loan originator will be right there to help you throughout the process – before, during and after the purchase of your home. We offer terms up to 30 years so you can find a loan that fits you and your budget. All of our loans feature very competitive lender fees. And our adjustable rate loans have no origination fees. Overwhelmed? Take a minute to learn more. 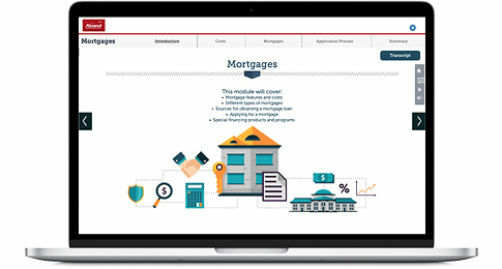 Visit our free interactive online financial education center for videos and lessons about mortgages. You'll be a mortgage expert in no time at all. Through our partnership with TruStage™ Auto and Home Insurance, we offer homeowners insurance with competitive rates and a member discount. Visit TruStage's site for a free quote. Is comparing annual percentage rates (APRs) the best way to decide which lender has the lowest mortgage rates and fees? The Federal Truth in Lending law requires that all financial institutions disclose the APR when they advertise a rate. The APR is designed to present the actual cost of obtaining financing, by requiring that some, but not all, closing fees are included in the APR calculation. In addition to the interest rate, these fees determine the estimated cost of financing over the full term of the loan. Since most people do not keep the mortgage for the entire loan term, it may be misleading to spread the effect of some of these up- front costs over the entire loan term. Also unfortunately, the APR doesn't include all the closing fees and lenders are allowed to interpret which fees they include. Fees for things like appraisals, title work, and document preparation are not included even though you'll probably have to pay them. For adjustable rate mortgages (ARMs), the APR can be even more confusing. Since no one knows exactly what market conditions will be in the future, assumptions must be made regarding future rate adjustments. You can use the APR as a guideline to shop for loans, but you should not depend solely on the APR in choosing the loan program that's best for you. Look at total fees, possible rate adjustments in the future if you're comparing ARMs, and consider the length of time that you plan on having the mortgage. Don't forget that the APR is an effective interest rate – not the actual interest rate. In addition, your rate and APR will be based on your creditworthiness and could be higher than the rate shown. Your APR and monthly payments will be based on the actual interest rate, the amount you borrow, and the term of your loan. The 15-year fixed rate mortgage offers two big advantages for most borrowers: You own your home in half the time it would take with a traditional 30-year mortgage. You save more than half the amount of interest of a 30-year mortgage. Lenders usually offer this mortgage at a slightly lower interest rate than with 30-year loans - typically up to .5% lower. It is this lower interest rate added to the shorter loan life that creates real savings for 15-year fixed rate borrowers. The possible disadvantages associated with a 15-year fixed rate mortgage are: The monthly payments for this type of loan are roughly 10 to 15 percent higher per month than the payment for a 30-year. And, because you'll pay less total interest on the 15-year fixed rate mortgage, you won't have the maximum mortgage interest tax deduction possible. An adjustable rate mortgage, or ARM, is a loan type that offers a lower initial interest rate than most fixed rate loans. The trade off is that the interest rate can change periodically, usually in relation to an index, and the monthly payment will go up or down accordingly. Against the advantage of the lower payment at the beginning of the loan, you should weigh the risk that an increase in interest rates would lead to higher monthly payments in the future. It's a trade-off. You get a lower rate with an ARM in exchange for assuming more risk. For many people in a variety of situations, an ARM is the right mortgage choice, particularly if your income is likely to increase in the future or if you only plan on being in the home for three to five years. For more information about our adjustable rate mortgages, please call 800-342-3086 and make an appointment with a Mortgage Loan Originator. Mortgage insurance should not be confused with mortgage life insurance, which is designed to pay off a mortgage in the event of a borrower's death. Mortgage insurance protects the lender against the additional risk associated with low down payment lending and may not be required on certain mortgage types. The mortgage insurance premium is based on loan-to-value ratio, type of loan, and amount of coverage required by the lender. Usually, the premium is included in your monthly payment. It may be possible to cancel private mortgage insurance at some point, such as when your loan balance is reduced to a certain amount - below 75% to 80% of the property value. Federal legislation requires automatic termination of mortgage insurance for many borrowers when their loan balance has been amortized down to 78% of the original property value. If you have any questions about when your mortgage insurance could be cancelled, please call 800-342-3086 and ask to speak with a Mortgage Servicing Representative. Click here to begin the application process or to complete an application you've already started. To make an appointment with a mortgage specialist, call 800-342-3086, ext. 8391 or complete the contact form. 62. Normal closing costs apply.